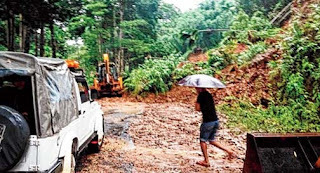 Aizawl, Aug 27 : At least three houses have been swept away by a mudslide and several others vacated in a north-eastern Mizoram town, an official said Wednesday, the latest in several weather-related incidents that have damaged property and caused hardship in the remote state over the past one week. Block Development Officer Zorammuana Khiangte said about 50 feet of the town’s main road has also sunk almost a metre and cut off Phullen from the rest of the state following heavy rains over the past two or three days. Fortunately, no casualties have been reported in the town, about 120 kms from state capital Aizawl. Consistent rainfall over the past few weeks have caused landslides throughout the state, temporarily blocking roads and highways and occassionally leading to mudslides that have buried residences. A few casualties have been reported, including a driver in his 20s who later died in a hospital after the vehicle he was driving was buried by a landslide near Sailam village, about 75 kms south of Aizawl, this past weekend. In eastern Mizoram, a Bailey bridge between Khawzawl town and Neihdawn village was damaged by strong currents of the Tuimuk stream on Monday night, cutting off several villages in the vicinity.